I worked a good long day Monday and then came home and had a nice dinner of Butternut squash, lentils in a curry sauce, beans in tomato and curry sauce, some lentil dumplings and sliced tomato and a bit of rice. Then I mowed the lawn while The Younger One and Missus cleaned up the trash the bear had scattered across the lower part of our lawn. When that was done it was too late to go for a ride and I spent some time with Missus and The Younger. The Older One was asleep by this time and it was a quiet evening. SO much to do in life. Come the weekend I will work my second job. I at least find the time to ride by riding to work. It could be that the visit from The Black Dog is related to this sense of over-occupation. Little rest. I think there few topics more filled with myths, legend and unsupported claims and beliefs than nutrition. Of course the information constantly changing from “official sources” doesn’t help. I am about as close to being a vegetarian as I am likely to get. I eat fish on occasion; once in a while I have some poultry. I never eat red meat. My menu is mostly fruits and vegetables. I get my protein from quinoa and beans and some other plant-based sources. 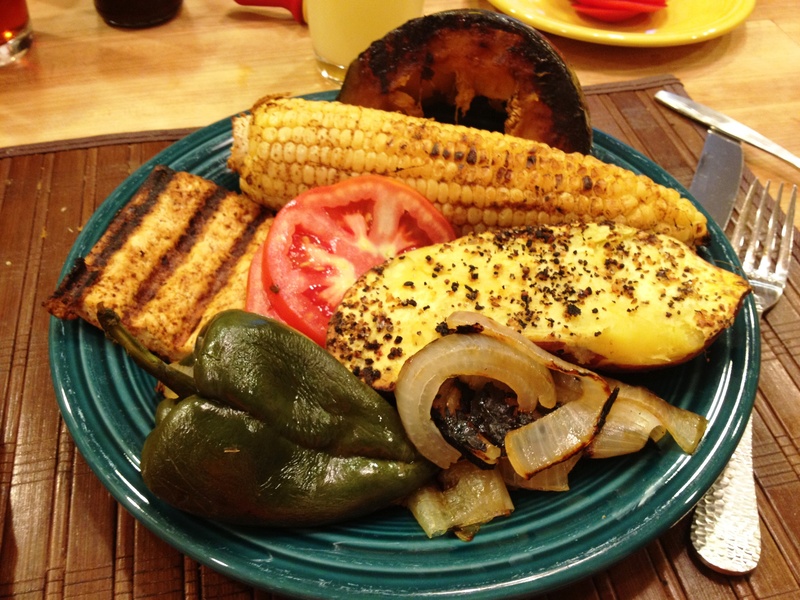 Grilled Tofu, sliced Jersey Tomato, Fresh Jersey Corn, Kabocha Squash, Sweet Potato, Grilled pepper and onion. What a wonderful and nutrition packed meal…. It is a concern to me that I get the nutrition I need of course. It is just hard finding out what that is. When I was eating everything in sight and in large quantities I get the critical nutrients almost by default. Eat enough foods and you will by accident get everything you need. I have always eaten vegetable and fruits. Combine that with the large quantities of meat I consumed and I was getting all my nutrients. With my much more studied approach to eating, I was a bit concerned about whether or not I am getting all of the nutrients that a growing (shrinking?) boy needs. Logging all my foods on Loseit.com as diligently as I do has helped me stay on top of this. What is interesting to me in this age of low/no carbohydrate diets is that my main source of calories is carbohydrates. So it looks like I am indeed getting the proper nutrition even if it flies in the face of current trends and fads. The only topic I know that surpasses nutrition for myths, legend and unsupported claims and beliefs is weight loss. I remember when I had lost around 18 or 20 pounds a well-meaning but misinformed friend told me the weight loss “doesn’t count because it is all water weight”. Let’s get this straight. Water weighs eight pounds per gallon. Saying that twenty pounds of weight loss is water is saying that I lost two and a half GALLONS of water. Not fat, ALL WATER. Understand that some percentage of weight loss is ALWAYS water. A healthy adult male is about 60% water, give or take 1-2%. That is all. The body is very efficient at maintaining this ratio because it is necessary to survive. If you are otherwise healthy with no underlying health issues that would cause you to retain fluids, and you are male, you are 60% water no matter how much you weigh. Extremely skinny men are 60% water. Very fit men are 60% water. Somewhat overweight men are 60% water. Morbidly obese men tend to have a slightly lower water percentage but it balances out as the weight loss progresses. If you’re a man and lose 100 pounds, just about 60 of those pounds were water. Women have a lower percentage of water than men. To say that weight loss doesn’t count because it is water weight or that the first ten pounds are all water is simply wrong. Weight loss is a loss of fat and water and “other” and can include muscle mass. As a man in his 50’s, I have certainly lost muscle mass as I have not worked on upper body at all and I doubt that my legs, built up with cycling, have compensated. When I say that 60 pounds out of 100 is water, I am not talking about “free” water stored in our bodies in secret hidden places. Blood, fat, muscle, etc., all have huge amounts of water as part of the cells and so forth. As we lose fat we lose the water component of that fat as well. As we lose muscle mass we lose the water component as well. As there is less body being fed by the blood stream we have less blood in our bodies. As we reduce the amount of blood in our bodies we lose the water content of that blood as well. Again, blood mass in the body remains remarkably constant at about 7% of our weight or put another way, 7 pounds for every 100 pounds of body weight. If we weigh 300 pounds then we have about 21 pounds of blood. At 200 pounds I have about 14 pounds of blood. So it can be said with a fair amount of truth that of my 100+ pounds of weight loss, 7+ pounds of it is the reduction in blood my body requires. So weight loss is always more than mere water loss or fat loss or any-single-thing loss. It is always a combination of factors, including the body adjusting to the new reality. Anyway, just some thoughts on that subject. Feel free to disagree. Why, I don’t know. On Monday my direct manager asked me to have dinner with him, the IT Director and the President of the company on Tuesday night. They all wanted to go to the local Asian Buffet. It is a little more upscale than that sounds. It is $30.00 bucks a person for dinner and the sushi and sashimi is prepared right in front of you and special hand rolls are prepared to order. There is a wide range of cooked dishes as well and many cold salads. In any case, I was surprised to be asked and I was glad to say yes. It was an interesting meal. We alternated jokes and ribbing with serious discussions about business. I contributed to both sides of the evening. What I am most proud of is that I kept the eating in check. I didn’t pig out. I ate reasonable amounts and I had prepared for it by eating lightly all day. It pleased me this morning I to see that my weight was right where it was the day before. Today the management team ordered in a bunch of pizza. They offered to bring in a salad for me but I declined. I had instead a microwave Indian dish, Rajma Masala. all natural, low-fat, low sodium, vegan. Delicious. I sat with them as they wolfed down the pizza and withstood the entreaties’ to have “just one slice”. I amuse the group. They all know my story. They all see how dedicated I am to the way I eat and the way I live. They can’t help but have some fun with it. I am glad that I am confident and dedicated enough to enjoy the teasing and resist the foods. There were quite a few fun moments Sunday. 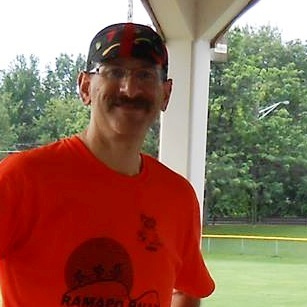 I was volunteering at the rest area of the Ramapo Rally, a very large organized bike ride here in North Jersey. The bike club to which I belong organizes the ride and has for 30+ years. I worked a rest area that served only the riders on the 100 and 125 mile rides. We got them twice. At 34 miles and 68 miles for the 100 mile riders and at 34 and 90 for the 125 mile riders. A fun group out having a great time. In the early hours I had to go to the ride start location, Campgaw Mountain in Mahwah, New Jersey, to pick up supplies and the all important Volunteers T-Shirt. This year it was BRIGHT Orange. When I went up to the counter the nice woman asked what size I needed. I said large and her eyes opened wide and she asked if I was sure I needed a large. In my mind I think she is going to ask if I wouldn’t rather have an XL. Old demons popping up. No, instead she asked if I didn’t think a MEDIUM would fit me better!! I assured her, with a huge smile on my face, that a large would be just fine. I smiled the rest of the day on that energy alone. Categories: bicycling, Cooking, Cycling, depression, Eating out, Emotional Well-being, FITBIT, fitness, Fruits and Vegetables, Proper Nutrition, Vegan, Vegetarian, weight loss | Tags: cooking, Cycling, diet, dreams, evening snack, excuses, exercise, Father-Son, fear, fitbit, fitness, food, Friendship, health, Hiking, Vegetarian, Walking, weight loss | Permalink. …and this is why numbers are important. Engage brain, do the math, and understanding follows. The real information about nutrition doesn’t change much over time. What changes is the hyped-up reporting, the hyped-up marketing, and the nutrient-free info we consume without thinking.